Teaching children about solar energy is a great way to introduce students to the concepts of renewable energy, climate change and energy equality with a global perspective. We worked with teachers to design a resource pack that tackles the issues of climate change and energy in schools, while bringing alive the science of renewables with a global dimension. These resources are free for you to use in your school – and have been downloaded thousands of times by schools in the UK, America and Canada. Absolutely brilliant… this has really caught the children's interest. We need to challenge our pupils and Sunny Schools does that. The hands on activities to raise awareness and understanding of renewable energy were really helpful. As was the link to global energy issues – kerosene lamps, the impact of solar as an alternative. 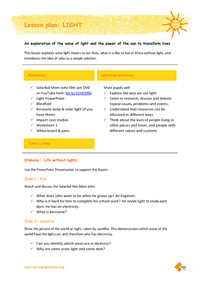 A lesson plan on light – This document outlines the lesson, and provides a brief checklist for materials, links, and other resources. Impact Case Studies – Understanding the importance of learning about solar is part and parcel of understanding the amazing impact it can have on people's lives. These case studies tell stories of the positive effects of solar lights. 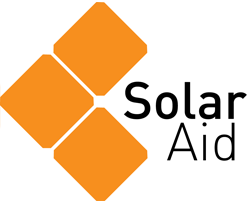 Light the Way Power Point – This PowerPoint introduces students to the many areas that SolarAid impacts. Sunshine vs. Darkness Worksheet – This worksheet is designed to be used with the case study cards. Once students have read the cards, this sheet can help them gain perspective on the negative aspects of kerosene, and how the solar lights help to combat those effects. Welcome & Introduction to Pack – This brief document provides an outline for the programme. We've worked with teachers to design a resource pack that tackles the issues of climate change and energy in schools, while bringing alive the science of renewables with a global dimension. Teaching Unit Cards – These Teaching Cards provide detailed descriptions of each of the six units in this pack. Quick Links doc – These links provide many external resources for additional information, as well as online activities. Activity Sheets – These Activity sheets are fun and thoughtful and promote stimulating discussion to follow the activity. Case Studies – These photo cards provide visual examples of a range of topics, to be used with the teaching pack. Photocards – These photo cards provide visual examples of a range of topics, to be used with the teaching pack. Photocards Glossary – This document describes each photo card. Cards 1-9 show some of the effects of climate change seen around the world. 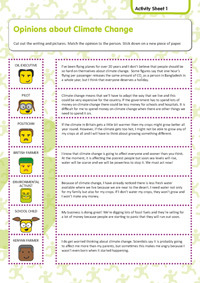 Cards 10-15 show some of the human activities thought to be causing climate change. Assembly Ideas – This document provides ideas for assemblies to explain what Sunny Schools is. The assemblies can also encourage more involvement with the rest of the school, and perhaps introduce an element of competition e.g. awards for best class at saving energy. Eco House Unit – In this hands on unit, students learn the impact of eco-friendly housing. They will design houses, and discover which features positively impact the environment. 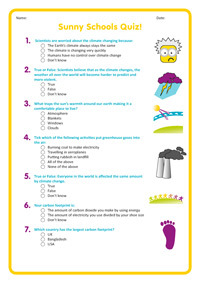 Sunny Schools Quiz – Taking a quiz can show students how much they have learned, and this quiz is structured to show just how simple it is to understanding how to mitigate climate change. Renewable Energy Factsheets – These 9 fact sheets break down the many forms of renewable energy, how they work, and where they operate most effectively. Solar Cooking Pack – The Solar Cooking pack describes another hands on lesson. In this unit, students learn about the problems of cooking in the developing world, and finish by building a solar cooker. Solar Data Sheets – These data sheets provide students with the forms to collect data on how much electricity their panels are producing, and recording the weather. Student Investigation Worksheets – In these forms, we provide a website and listed a questions. Students can research using the links, and books to answer the questions. 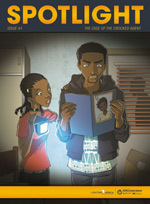 This great little comic, produced by the World Bank, features an investigative journalist in ‘The case of the crooked agent’ which introduces some of the basic facts of solar lighting. The comic also features a solar fact sheet, a comprehension crossword and instructions for and experiment about refraction and how to build a solar oven.